Nepal was one of the six countries who signed the MEFIN Declaration of May 2013 (also known as Cebu Declaration) and signified support to the promotion of inclusive insurance as a strategy for poverty reduction in the region. 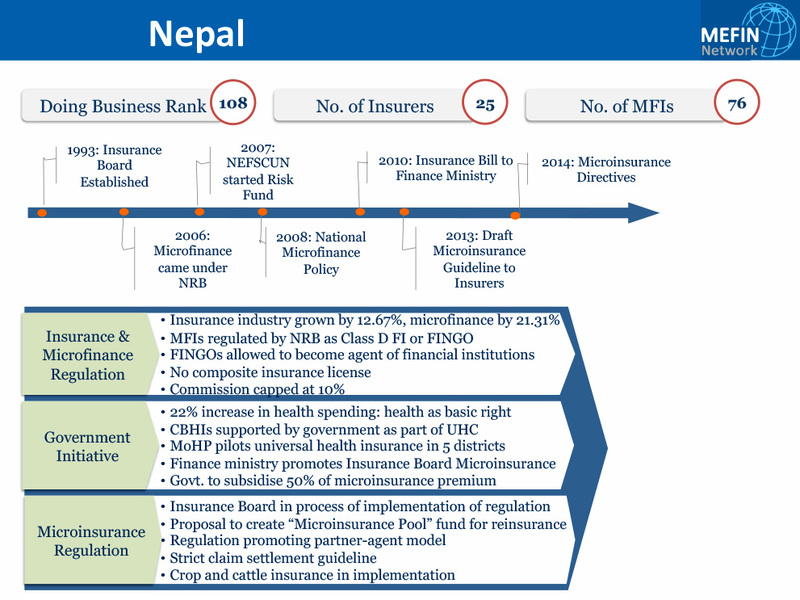 In January 2016, Nepal renewed its commitment to the MEFIN Network which was then formalized as a regional platform for peer-to-peer exchange of knowledge and experiences in inclusive insurance. The insurance in Nepal does not have a long history. Modern insurance company began in 1947. The first insurance company was named as Maal Chalani ra Bima Company which was later renamed as Nepal insurance and Transport Company in 1959. It was further renamed as Nepal Insurance Company Ltd. In 1968, the government of Nepal established Rastriya Bima Sasthan under the so-called Company Act. By virtue of the Insurance Act of 1992, Beema Samiti (Insurance Board) was established as an autonomous body to develop, systematize, regularize and regulate the insurance business of Nepal under Insurance Act of 1992. As a regulatory body under the Finance Ministry, its main concern is to create a professional, healthy and developed insurance market in the country. Nepal is a landlocked country located along the Himalayas and bordered to the north by China and to the south, east and west by India. It is separated from Bangladesh by the narrow Indian Siliguri Corridor and from Bhutan by the Indian state of Sikkim. The mountainous north of Nepal has eight of the world’s ten tallest mountains, including the highest point on earth, the Mount Everest. Throughout most of its history, Nepal was a monarchy until the 1st Constituent Assembly on May 28, 2008 overwhelmingly favoured the abolition of monarchy and the establishment of a federal multiparty representative democratic republic. On September 20, 2015, a new constitution was announced in the Constituent Assembly. The new constitution established Nepal as a federal democratic country. Nepal is a developing country and has been making steady progress with the government commitment to graduate the nation from this status by 2022. Nepals's Gini ratio, the coefficient that measures inequality among income distribution, lies at 32.8 and the HDI at 0.548.